•It’ll tame your sweet tooth. Cardiologist Dr. John Higgins says that your liver needs water to transform stored energy into the sugars that fuel your cells. And being just a few ounces short disrupts that process, and makes us crave sugar from other sources – like candy and donuts. 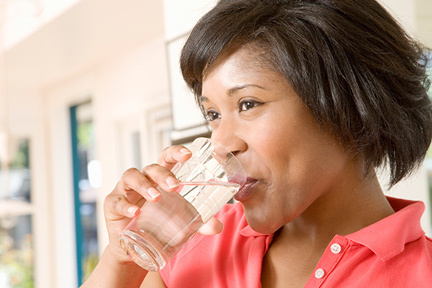 •Drinking more water also reduces aches and pains. According to the Mayo Clinic, our bodies need a minimum of 8 cups a day to operate efficiently. Less than that, and our electrolyte levels get out of whack and our blood gets thicker, and flows more slowly, making our heart work harder. Which leads to headaches, constipation, and muscle pain. •Finally: More water equals safer road trips. A study in the journal Physiology and Behavior shows that being dehydrated will literally double your risk of an accident while driving. That’s because it throws off the balance of important brain neurotransmitters and gives us the reaction time of a drunk driver.